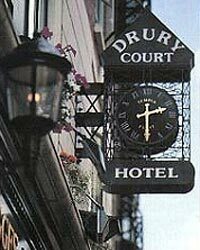 Ideally situated The Drury Court Hotel is located in the heart of Dublin city and is only a step or two away from all Dublin’s major attractions, St Stephen's Green, Trinity College, bubbly and popular Temple Bar and many more. The business districts are close at hand and the hotel is the perfect base for the business or leisure guest. The hotel offers 32 modern, superbly furnished and very comfortable bedrooms. All modern facilities are available for convenience and comfort including direct dial telephone, TV, computer/fax points and room service. The hotel also provides trouser presses, hairdryers, laundering service and tea/coffee making facilities. And for the small business meeting the modern meeting room seats twenty five people. The hotel is known for the warmth of its welcome and for providing a very enjoyable stay and guests return time and time again. Guests are offered a full Irish or continental breakfast. There are excellent lunch specials, evening A La Carte and a very tasty All Day Menu. Food is cooked with care to a high standard and delicious vegetarian options are also provided. The modern bar is always full of life as it is popular with both visitor and tourist alike. The hotel is Located in Dublin’s City Centre, within walking distance of the main attractions including. Trinity College, St Stephens Green Park, Dublin Castle, Dail Eireann, National Concert Hall, Christchurch and St. Patrick's Cathedrals and many more. Dublin’s most famous shopping street Grafton Street is close by as is Temple Bar with its quaint cobblestone streets, unique shops, clubs, bars, restaurants and cafes. The hotel is also close to the main business districts. This hotel is the perfect base for the business meeting, shopping trip, exploration trip or romantic weekend.